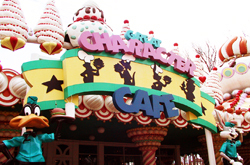 Time Warner's upgrading of Six Flags Great Adventure continued in 1995 with new shows and attractions, updated facilities, and the ongoing introduction of its Warner Bros. characters into the park including the Looney Tunes inspired Great Character Cafe taking over the Yum Yum Palace. The headline attraction for '95 was the Viper roller coaster by Togo International, the same makers of the park's now gone Ultra Twister ride, built on the same site as that coaster. 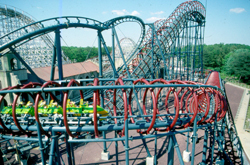 The ride offered unique styles of inversions but its compact layout caused the coaster to be less than enjoyable and probably Great Adventure's least popular roller coaster. Virtual Revolution, an upcharge simulator ride, was also added this year in the Right Stuff Mach 1 Adventure's gift shop. 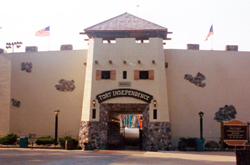 The entrance experience and the Main Street secion of the park finished what turned out to be a three year revitalization of that area with the addition of new lockers just outside the main gates, and a redesigned facade of the Aqua Frolics stadium into a colonial themed Fort Independence. 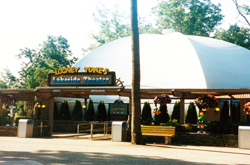 Next door, the Adventure Theater's presentations of Cinema 180 films was retired and the theater building converted into a character meet and greet named the Lakeside Theater. 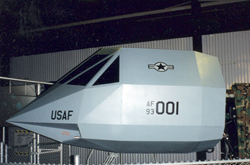 It was obvious that the new Right Stuff simulator ride and film far surpassed anything the Adventure Theater could offer. 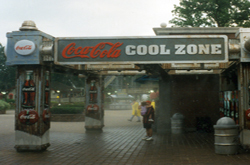 The new Coca-Cola Cool Zone themed around an Axis Chemical depot offered a cool misting station for guests to refresh themselves with numerous Coca-Cola vending machines incorporated to assist in relaxing. 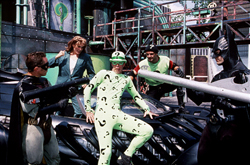 The Cool Zone was built just outside of the Batman Stunt Arena which offered an updated adventure with the Caped Crusader battling Harvey Two-Face Dent and the Riddler in an all-new Batman Forever Stunt Show. When all was said and done, 1995 proved to be a record breaking season. 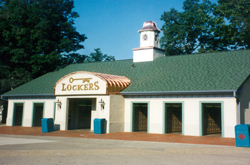 With a 20% increase of turnstile clicks the park broke the four million guest ceiling - something that was their goal since opening season in 1974. This milestone caused much excitement at the park, and soon words like "hotel," "water park," and "newly gated park" would soon be circulating through more than just the rumor mills.